I just got home from a week-long music camp in Washington state, where I always lead one or two drop-in loop braiding workshops. It’s very casual, not much preplanning, a lot of fun, and I always learn a lot myself. This year it was a small but enthusiastic group. There were a few new braiders, and six who had braided with me in previous years. Three of them didn’t need a refresher course because they apparently hadn’t stopped braiding since I last saw them! 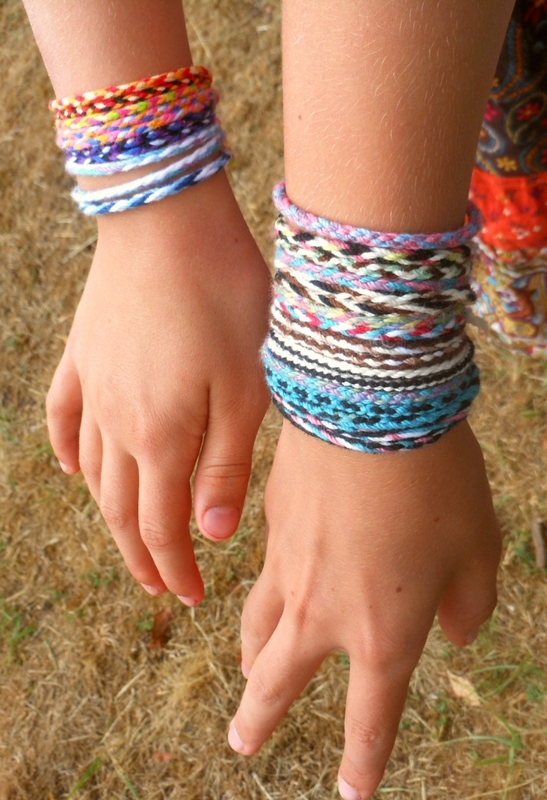 Adah and Hannah were 8 and 9 when I taught them square and flat three-loop braids last year. Wes, Adah’s younger brother was only 5 then—much too young to loop braid. But he had been so determined and adept that he had learned it anyway! 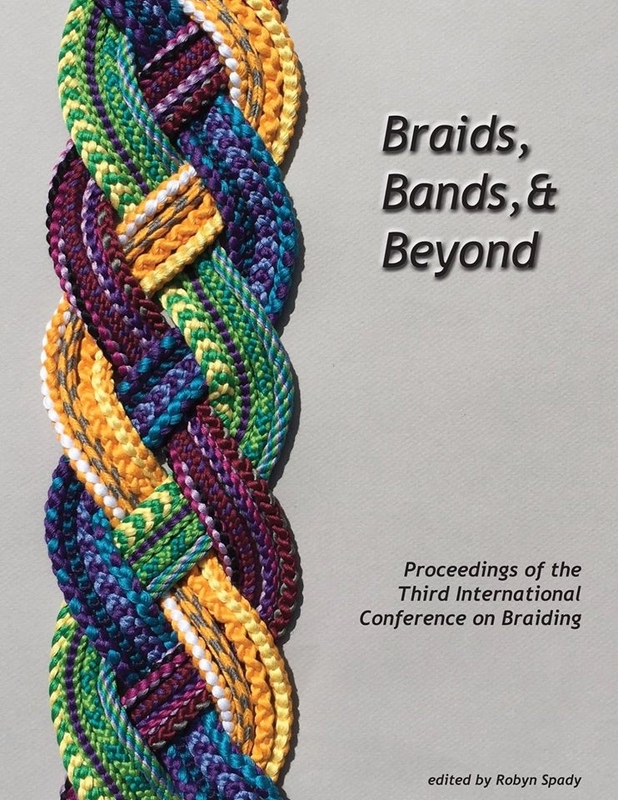 Over the last year, the two girls had taught themselves how to braid with even more loops—all the way up to seven, which is really tough for younger children’s ring fingers. (I don’t think either of them likes making 7-loop braids yet, but they certainly know how to do it!) This year the three of them were joined by Amelia (9), first-time loop braider, and among other things, all four kids learned how to braid lengthwise stripes using bicolor loops. They were so into it that they kept on braiding for the rest of the camp-out. It was a first for me—I had never taught bicolor loops to kids before… For some reason I even got a kick out of hearing these guys talking to each other about their bicolor loops! They did some fun variations of the lengthwise striping pattern that I teach in my Bicolor loops magic tutorial. 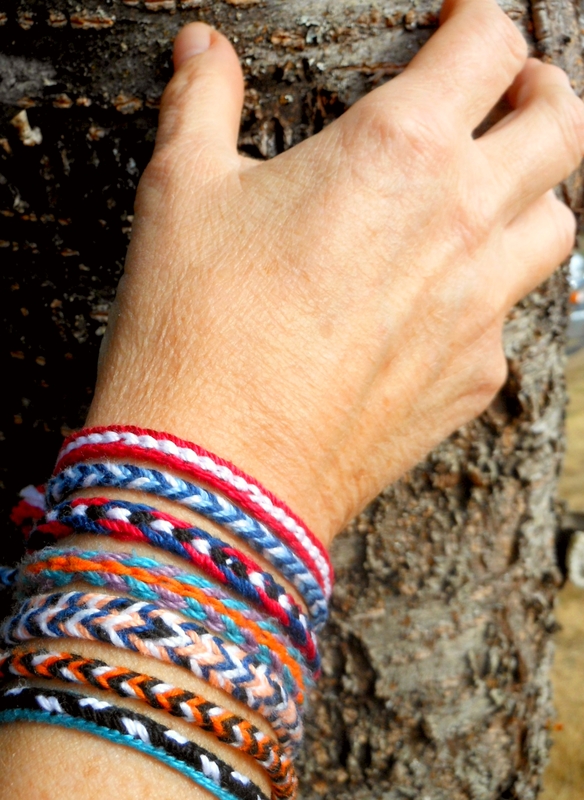 One variation is rainbow bicolor stripes—in the photo above, see the lowest braid on the right wrist for an example. Each of the loops in that braid had one black shank, but the other shank of each loop was a different pastel color. Cyndy easily learned how to unbraid right along with learning how to braid. She happened to ask me, so I showed her. No problem! I hereby vow to always teach this right from the beginning—at least in any workshop longer than a quick 20-minute demo. My Canadian friend Carolyn braided a two-color Barleycorn braid that was stunning, I can’t wait to try this myself. It’s the red and white braid at the top in this photo. The third and fourth braids from the top are also Barleycorn in their braiding method, but it’s hard to tell, because their color-arrangement is not traditional at all! Carolyn’s two-color red and white Barleycorn braid is similar to the braid in Cindy Myers’ instructions, but both of her contrast color loops were white. That’s what creates the long central row of white “kernels” rather than alternating black and white ones. 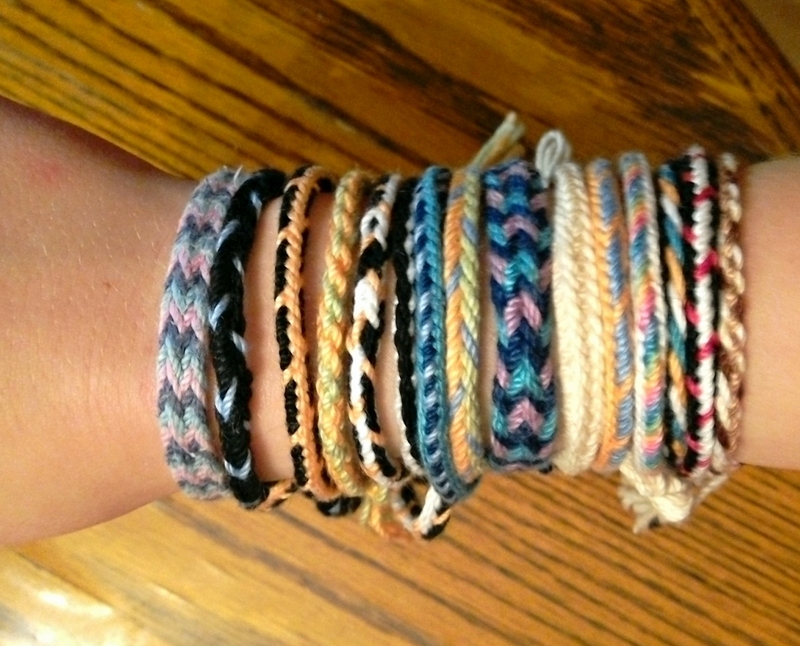 Like the four kids, Carolyn kept braiding non-stop over the next few days, workshop or no workshop…The lowest bracelet on her arm in the photo is a slightly different color-pattern of the 7-loop D-shaped braid from the ones I’ve taught here so far. It’s similar to the first pattern that I taught in the video. For this variation: Make only 2 bicolor white/blue loops (instead of 3), and 5 bicolor black/blue loops (instead of 4). Starting set-up: Only the right hand loops are slightly different—the A and B fingers would still start with white up, but the right C finger would start with black up for this variation. My next post will be on color-patterns for 6-loop braids. 6-loop braids can have some fantastic color-patterns that are only possible with an even number of loops! I’ve only mentioned 6-loop braids on this site once, as an aside in my bicolor loop tutorial, but they have a lot of other possible color patterns, including some nice ones for flat braids. Six loops is also a great braid to learn after you’ve mastered 5-loop braids, as a segue to learning 7-loop braids. With 6 loops, only one hand has to do the moves of a 7-loop braid; the other hand just does those familiar 5-loop braiding moves, so it can be an easier way to get used to the new moves. August 25, 2015 in Color patterns, Readers' gallery. Oh, I love the 2 color barleycorn. Doh! Such an easy thing to do but it never occurred to me.